1st rule of Friday Night Club…You do not talk about Friday Night Club. It was crowded, hot and very humid aboard the sweat-filled bus. The majority of the passengers were cover head to toes in white clothing. Some sporting red scarves and handkerchiefs (that’s actually how you spell it…no joke). 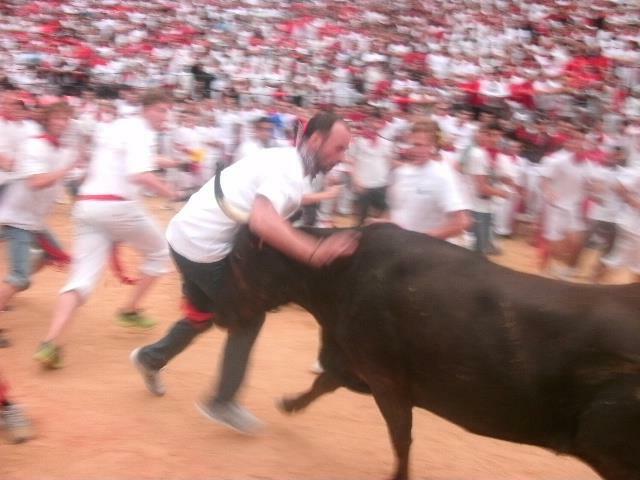 We had just hopped on a bus in Madrid and were heading to Pamplona, Spain to RUN WITH THE BULLS!! This story is NOT about our mad dash from the Bulls. It is about the journey there, but I will get to the actual running, festival and other good stuff on another post. SO on the bus…my good friend and I were sitting next to six English guys who were explaining one of the most intriguing travel ideas I have ever heard of. They were all part of a group called Friday Night Club. WTF is Friday Night Club?? Sounds pretty lame, but you have to remember that witty English blokes are telling this. Therefore, the name was not under much scrutiny yet. Friday Night Club meets once a month…you guessed it on Friday. This club consisted of six guys, one who arranges it, but they rotate the planner each month. The person arranging is the only one who knows the details. The other guys are only told the date, time and where to meet right after work on Friday. They were from London, got told to meet at a pub with their bags for the weekend, and had no clue if they would be going somewhere warm or cold. They did know they would be traveling and to bring their passports other than that they had no clue what was in store. Can you imagine going to the airport and it being a surprise which country you would be going to every month? They flew from London to Madrid, and at this point still not knowing what their final destination would be. 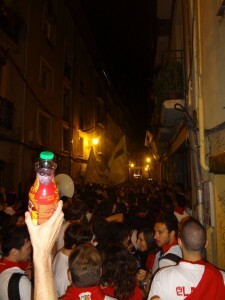 Finally, once in Madrid they started to realize they would be heading to the Running of the Bulls in Pamplona! It is such a crazy concept. Travel somewhere every month, no idea what to pack or where you are going. Five guys left in the dark. While the planner has some big event planned for the weekend. All of them had full time jobs and to fund Friday Night Club they put aside part of their paychecks each month. The weekend turned out to be the most memorable, crazy, fun, and adrenaline filled weekends of my life. Went homeless for three days, met some amazing people and now have some great stories to share the rest of my life. Filed under Blog, Front Page.